Not too soon to be thinking about Mother's Day gifts, is it? :-) I have a fun gift presentation idea for you! Flowers for Mom are always a hit, but let's go a little further. 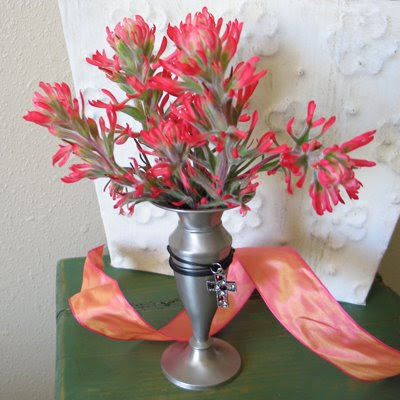 Decorate the vase with a cross necklace and you have a three-in-one unique gift! No wrapping required!! If your pendant has a modern leather-style chain, it will cling to the vase like mine did, or simply use a vase with an indented neck for the chain to rest on. And, since Mother's Day is just over a month away, you have plenty of time to find the right vase and pendant combo ... and to leave hints around the house for one for yourself if you're a mom! 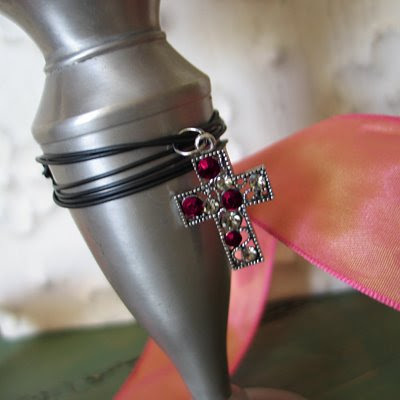 This idea is also cute for a birthday gift. 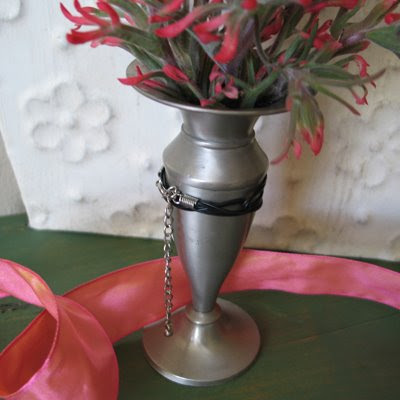 Or a home accent piece – use an inexpensive cross necklace, remove the pendant from the chain and put it on a little piece of ribbon to fasten around the vase. Look around your home and see what vases you already have that could use your personal touch!